With fashion weeks in full force, there are numerous styles of shoes strutted down those runways in New York, Paris, to Milan. Spring 2017 shoes are extremely cool, interesting, and creative in terms of colours, and design. There are certain runway styles that I believe will make their successful way to the streets. Hence, I’ve decided to compiled a list of on-trend shoes which you can rock this Spring and look effortlessly chic. This Spring, it appears that the ankles are still a great part of the body to be accentuated. Whether, we’re looking at suede lace-up wraparounds or thick wraparounds in leather , we see many designers that create their masterpieces in an enticing way that both reveals a glimpse of skin and covers beautifully. The wraparounds sometimes designed in chunky form, sometimes dainty, but very often bringing the gaze to that slimmest part of legs. Who says flats can’t be edgy? A pair of black leather pointed toe flats with eyelet detailing and lace-up is sure to add a splash of edge to any of your looks. Nothing can be more perfect than this gorgeous lace-up wedge sandals that instantly put you on a vacation mood! Everyone could benefit from this stylish and versatile black suede lace-up pointed toe high heel stilettos. Crafted with velvety vegan suede, this pair of beaut is formed to an unstoppable pointed toe upper, sturdy heel cup, and beautiful lace-up vamp with gold aglets that make this pair the utterly perfect shoes for this year! Cruise into any occasion, looking stylish AF with this gorgeous. Style it with a slouchy tee, a pair of cropped hem jeans for a chic weekender look. 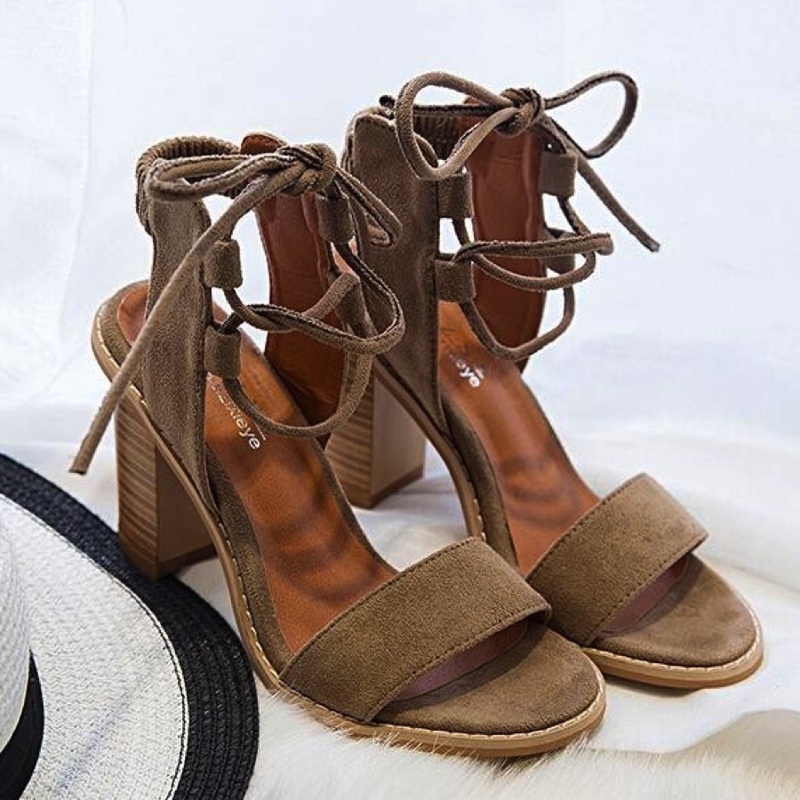 From the moment you slip on this enticing brown suede lace-up sandals featuring block heel, your entire outfit will immediately transform into a bombshell look! These on-trend babes feature a single toe strap, and sturdy heel cup fashioned with long , tying straps. This pair of gorgeous complements any outfit and looks extremely great when you style it with a romper or a short flirty dress. Everyone could benefit from the chic style that this utterly enticing leather lace-up high heel sandals being! The softest leather shapes a caged peep toe upper, while matching laces toe above the ankle and a high rise heel back. Now, living out a #luxelife is an everyday occurrence! Team this pair of beaut with literally everything, ranging from denim skinnies to a feminine dress. All wrapped up is one of the hottest shoe trend this year. Make your friends totally jelly when you step out in this rad suede ace-up peep toe high heel stilettos featuring cutout detailing. The soft vegan suede shapes this gorgeous in a caged, peep-toe upper with a lace-up detailing, and a back zipper. The cutout detailing is a gorgeous and unique addition that makes this beaut stands out even more. Match this heels with anything and everything. For an elevated everyday look, team it with a white button down, and a pair of straight leg jeans with cropped hem. For those who hate the ideas of wearing heels, kitten heels will be your life saver, as it is the perfect little formula to add an arch without hurting the feet and create an air of adorable mystery. There’s nothing sexier than giving just a hint of something special! Break the conventional way of how you usually style your kitten heels, by wearing a pair of socks this season! It will definitely make your outfit pop just like how Lafotka did by pairing it with fishnet socks. Spice up your everyday go to outfit with a pair of kitten heels as it instantly injects a classy accent to any of your outfit. Step out in this gorgeous pair of lace-up pumps which features a pointed toe and graceful kitten heels. The combination of pointed toe and kitten heels not only gives you the feminine and classic touch but also super comfy to walk in! Most important is they are so versatile that they can take you everywhere – from classroom to a date! Apart from these, the highlight of this gorgeous pair is definitely the elegant lace-up details through the front. You’ll be looking highly refined in this absolutely gorgeous and classy suede pointed toe kitten heels featuring ankle straps. What’s greater when you can have the best of both worlds with only a pair of shoes. The vegan suede shapes a pointed toe upper with metal embellishment that instantly amps up the glam. It also showcases gold metal ankle straps and buckle that makes this beaut the on-trend shoes. The kitten heels with a sturdy cup will be everything you need to have a comfy walk 24/7! 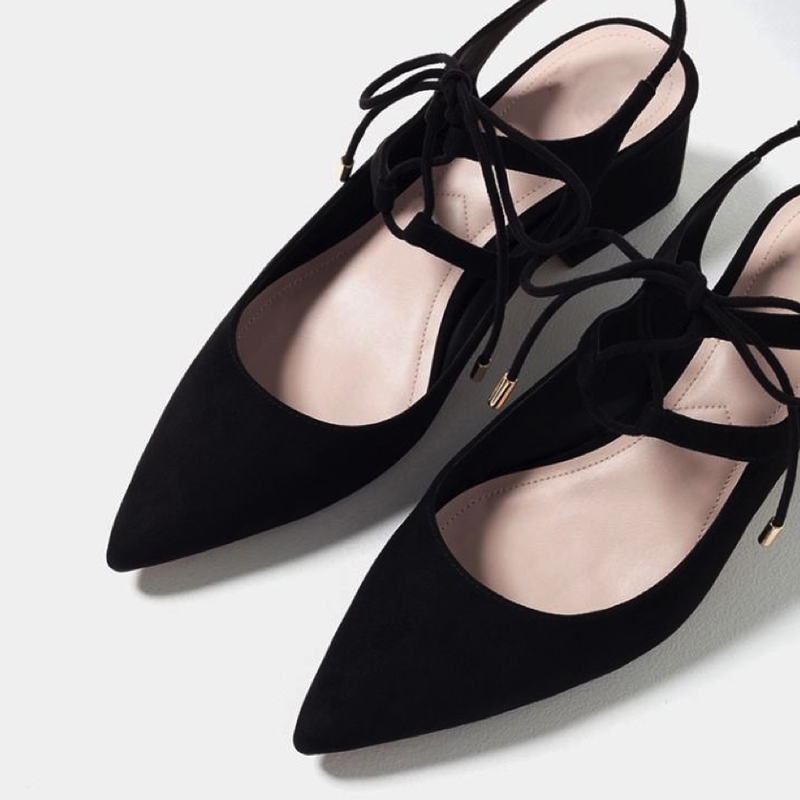 Kitten heels are having a huge moment this year, and this lovely pair of bow accent pointed toe suede kitten heels will elevate your everyday look effortlessly. Crafted with soft vegan suede, this enticing pair is in a form of pointed toe with a bow accent embellishment, a sturdy cup, and low heels that give you the ultimate comfort to wear from A.M. to P.M. Heading to office? Team it with a blouse, a pair of wide leg pants, and a tote bag. For a fancy dinner, team it with a LBD and a box clutch. There’s no need to play ‘height’ to be chic. This gorgeous suede pointed toe kitten heels featuring rivets embellishments which just right in front of you is utterly perfect! Pointed toes and micro pumps characterise this vegan suede, staple-worthy footwear, which may be cropped in stature, but boast truly high style! The highlight of this beaut is the rivets detailing that instantly amps up the glam. Regardless as part of chunky collections with ankle straps that are nice and thick, or with thin strands around that slender area and riddled with colours and patterns, the open back or cutout back footwear is totally in and we are not just talking mules either. 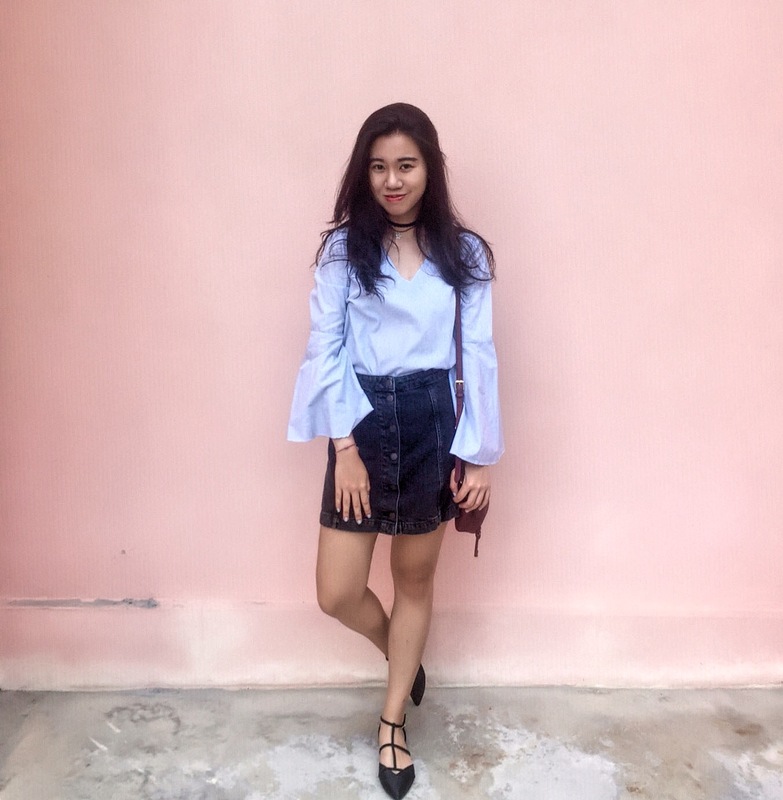 Chriselle added a splash of edge to her look, by teaming her open back pointed toe mules with a pair of straight leg jeans and a cold shoulder shirt. A pair of caged block heel sandals with open back detailing not only spice up your look but also bring your Spring and Summer ootd to a whole new level. Open back shoes are having a huge moment this year, and our love is blossoming big for this stunning suede pointed toe ankle booties with cutout back! Vegan suede that shapes this bootie in a form of fierce pointed toe, cutout along the stiletto heel, and a gold buckling ankle strap. Cruise into any occasion and season, looking effortlessly stylish with this beaut. A true treasure, this heavenly gorgeous rivets embellished pointed toe strappy heels with open back detailing will always feel like a special find! Sleek and glossy patent leather makes a statement throughout a pointed toe silhouette, making this pair of gorgeous the perfect staple for any occasion. The gold rivets that glint on the caged straps instantly amps up the glam. Trust me, your friend is going to envy you when you make an entrance in this. Give your shoe rack a new update with this versatile and stylish pointed toe sling back high heel stilettos! The sleek patent leather shapes this minimal beaut in a pointed toe silhouette, high heel stilettos, and a sling back that shows off your flawless skin. Running out of time but want to look put together, just slip into this beaut and see how it makes wonders to your outfit. Goodness! This pair of suede low chunky heel is absolutely gorgeous in style! Do not miss it as I am sure you will make it a staple piece in your everyday look very soon. Low in height which is a comfortable wear, totally perfect for any occasions from a casual day out to formal night events. Styled with pointed-toe front which helps to lengthen the legs and creating a slimmer look. While adding some flattering details with lace-up strap design for a feminine touch. It also comes with a sling back strap for a secure wear. This year, high shine shoes have been taken to a whole new level. You’ll spot this trend appears not only on a party heels but also casual shoes such as sneakers. This is one Spring/Summer 2017 shoe trend that we can really have a lot of fun with, especially if we make the shoes the statement of the outfit for the day. A pair of metallic sneakers sure make your everyday casual outfit pop! Looking for something to break the boredom of your smart casual look? Seek no further than a pair of metallic heels. Make a flashy fashion statement this time with a pair of metallic ankle-strap heels. This pair of stilettos would definitely be of use when you go for a date, special events or even for a daytime outing! Totally a versatile piece. This pair of metallic stilettos comes with an open-toe design and super fine straps on the ankles which totally look flattering on the legs. So let the shiny metallic do the talking. All you need is to get them matched well in your outfit. Do not wait till the night to get this stunning shiny heels out! Try them for a daytime look by pairing it with a cold-shoulder top and a pair of skinnies! Voila! You have nailed the stylish look instantly! This glamorous metallic pointed toe high heel stilettos featuring t strap detailing don’t just star in the show, the run it! The sleek metallic hue vegan leather that shapes this heels in a form of pointed toe silhouette, and carry into a t strap detailing, and an adjustable ankle strap with buckle. 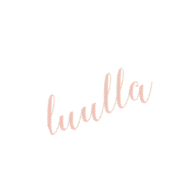 Perfect for day and night, this gorgeous promises to highlight nothing less than your very best. All the A-lists can’t help but to fall head over heels over this enticing pair of metallic platform sneakers! 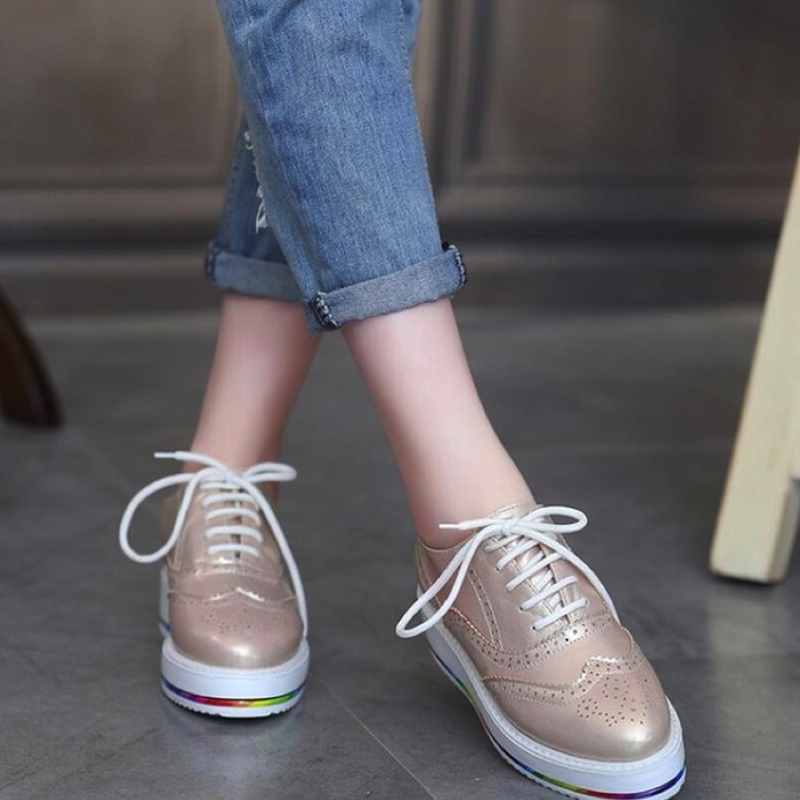 These unique loafer-inspired sneakers have a metallic perforated upper, laces, and white rubber sole with rainbow colour accent trim. That’s all for today’s Talking Trend topic. Do not hesitate to leave us a comment as we would love to hear from you which trend is your favourite! Create a show stopping look with this pair of babe by teaming it with an all white outfit!